It’s true that the Vietnam War was one of the most important events in our nation’s history, but how did it change us as a country? First off, we no longer trust our government as we once did. LBJ’s lack of candor, the shock of the 1968 Têt offensive, Nixon’s deceptions and, last but not least, Watergate, convinced a lot of ordinary citizens that our government was not to be trusted. Government officials and radio talk show hosts have thrived on this fodder ever since; the modern-day Tea Party is just one of many offspring, the influence of the middle class is just one of many casualties. Next, the war drove a wedge between the military and the news media. During World War II the media were not hyper-critical of our military establishment. In return the military trusted reporters not to compromise security and the trust was not usually abused. In Vietnam, reporters came to believe—with good reason—that the military was frequently playing fast and loose with the truth. Starting with the daily MACV (Military Assistance Command Vietnam) press briefings in Saigon and extending up to Secretary of Defense Robert McNamara’s news conferences in the Pentagon, the reports sometimes bordered on out-and-out lies in the eyes of reporters. In many instances a reporter would be in the field to see, or even film, an event only to be told hours later that what he had seen had happened differently, or had not happened at all! Reporters reciprocated with highly critical coverage. By the end, many professional military looked on the news media as the enemy and vice versa. Note: the embedded reporter characteristic of today’s war coverage is a result of the coverage of the Vietnam War. It was the first war lost by the United States of America, and in addition to being a traumatic event domestically it forced our allies to reassess their relationships with us and encouraged our enemies to do likewise. The war had split the nation like nothing else since the Civil War a century before. Millions had participated in the war and millions more were active in trying to stop it. Political violence in the streets shocked and scared the nation and helped to knock out two presidents. Even after forty years the war continues to divide us as a nation. We committed significant combat forces to Vietnam under President John Kennedy; there were some 16,000 US military personnel in South Vietnam when he was assassinated, and a significant number of those—despite the fiction that they were all “advisors”—were combat soldiers: Army Special Forces troopers, Army and Marine helicopter crew members and Air Force Special Operations pilots. Under Lyndon Johnson the peak military commitment in Vietnam reached some 550,000 troops in 1968-69. The war was supported by the American population, according to polls, until the events of the 1968 Tet Offensive began to turn national public opinion against the war, and LBJ’s party (D). A lot of Americans lost interest in the war after 1973 when Henry Kissinger and Le Duc Tho signed on the dotted line in Paris and our POWs came home. But for the ARVN and the small number of American advisors remaining in South Vietnam, the war ground on. Ultimately, North Vietnam triumphed in 1975, but even then the war wasn’t over. It went on long after our ambassador climbed into a Marine helicopter on the Saigon embassy roof. No sooner had Hanoi taken over in the south than the victorious Khmer Rouge started a vicious war to regain what they considered their lost Cambodian provinces in the Mekong Delta. That war culminated in the Vietnamese invasion of Cambodia on Christmas day 1978, followed by the overthrow of the Khmer Rouge regime and the start of a bitter guerrilla struggle in which the Thais, scared witless by the Vietnamese threat, backed the Khmer Rouge with support from China. Not until 1991 did the Khmer Rouge agree to participate in a coalition government. In 1975, as South Vietnam was going down the tubes, the CIA provided final shipments of arms to a group of dissident tribesmen, Montagnards as they were called, in the Central Highlands of South Vietnam. The tribesmen in question, FULRO, the French acronym for United Front for the Liberation of Oppressed Races, had taken up arms against the Vietnamese—North and South, though they had a bigger problem with the communists—in 1964. After the fall of South Vietnam they continued to fight, at first with Khmer Rouge support. Then, in 1979, they faded into the remote jungles of extreme northeastern Cambodia. The last remnants, 398 combatants and their families, handed over their arms to Malaysian troops of the United Nations Transitional Authority on 10 October 1992. Mercifully, they were flown out to the United States. And I suppose I should add that although the Vietnamese-backed Cambodians had the upper hand by then, the last Khmer Rouge holdouts didn’t lay down their arms until 1997. The war recognized no borders; it crossed over into Laos and Cambodia from the start, and there was a nasty North Vietnamese-backed guerrilla insurgency in northeastern Thailand from the mid-1960s. 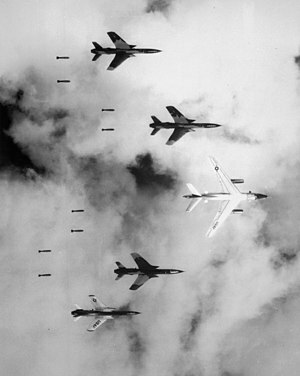 US aircraft flying from bases in Thailand played a major role in the air war against North Vietnam; B-52s flying from Guam, and later Thailand, bombed Viet Cong sanctuaries in South Vietnam, and later targets in Laos and North Vietnam. Sometimes it was a guerrilla war and sometimes it wasn’t. The French tried hard to turn it into a conventional war… and succeeded all too well at Dien Bien Phu… except that in a bizarre irony Dien Bien Phu turned into an uncanny recreation of an eighteenth century siege, a lot like the ones that Marshal Vauban supervised for Louis XIV of France. For us, it was almost entirely a guerrilla war until 1963. In 1964 it threatened to become a conventional war, advantage Viet Cong. From our intervention in force in early 1965 through the 1968 Têt Offensive, it was more conventional than guerrilla, but with important elements of both. It also varied according to region. The war in the southern Mekong Delta was almost entirely guerrilla from beginning to end. During our war, the war in northern South Vietnam was mostly conventional from the start and after the 1968 Têt offensive was almost entirely conventional. And then, in a final, bitter, irony, the communists, decimated in the guerrilla war following the Tet Offensive, conquered the south in 1975 with a conventional blitzkrieg-style offensive, tanks, artillery, rockets, anti-aircraft missiles, and the whole bit. Only a bare majority of Army enlisted KIAs—men killed in action—were draftees, 50.5% to be exact, and no less than 94.6% of Marine enlisted KIAs were volunteers. The Air Force suffered considerably fewer casualties than the Army or Marines, but those casualties were mostly aircrew members, almost all officers, and relatively senior ones at that. The mean rank of Air Force KIAs was between captain and major, a pilot or navigator in his early to mid-thirties. The Air Force lost nearly as many lieutenant colonels as first lieutenants and a significant number of full colonels (in contrast to the Army and Marines who lost almost none). The Navy’s officer casualty profile was similar to the Air Force’s: most KIAs were aviators, lieutenants and lieutenant commanders shot down over North Vietnam. With regard to education, the men who served in Vietnam were better educated than their forefathers who served in World War II, and Korea. The vast majority of enlisted personnel had high school diplomas. Most officers—effectively all in the Air Force and Navy—were college graduates, and a significant minority had advanced degrees. In fact, the only significant body of officers without college diplomas were Army warrant officer helicopter pilots, and most of them had some college. One of the persistent misconceptions about the war concerns the economic profile of the soldiers—It is not accurate to state that the great bulk of the young men we sent off to die in Vietnam were from impoverished backgrounds. The truth of the matter is that there was no significant correlation between the relative prosperity of the soldier’s home town—using “soldier” in the broad sense to include all military personnel—and the likelihood that he would be killed in Vietnam. Actually, that’s not quite right: there was a slight correlation, based on the fact that Southerners were more likely to enter military service and mean incomes were lower in the South than other regions. But when you adjust for mean income by region, New England, South, Midwest, West Coast, and so on, the difference goes away. In fact, a group of researchers at MIT did a careful set of comparisons, matching up a large sampling of names from the Vietnam War Memorial with census data on their home communities, and discovered that those from districts with higher per capita income were actually more likely to be killed… which stands to reason when you think of it: these were the college kids, ROTC and OTS-trained officers and a smattering of service academy graduates, who commanded platoons and flew fighter planes and helicopters. Did African Americans die in disproportionate numbers? During the war, many believed this to be true—Dr. Martin Luther King, Jr., for example—and argued that the disparity in casualties between white and black was due to racial discrimination. For a time this was a hot political issue. In fact, black males comprised 12.4% of the populace in the relevant age groups and accounted for 12.2% of Vietnam KIAs (those killed in action). But that’s only part of the story: when we first committed line infantry to Vietnam, Blacks did account for a disproportionate share of US casualties, at times as much as 40% according to some accounts. The reasons were straightforward: Blacks tended to come from communities with poor educational systems. As a result, they tended score poorly on the AFQT (Armed Forces Qualification Test), the basic mental test that all inductees took, and were therefore assigned to the infantry rather than to technical fields—aircraft maintenance, intelligence, or even artillery—that demanded higher scores. As we’ve already noted, most KIAs were infantrymen; since blacks were over represented in the infantry they died in larger numbers. But that was more likely due to educational rather than racial discrimination; Southern whites suffered disproportionately for the same reason. And there’s another factor: the US military was the first American institution to be integrated, and many Blacks joined during the 1950s and ’60s because that was one of the few places they could get a “fair shake.” By the time we got into Vietnam, they represented a disproportionate number of NCOs, particularly in the combat arms of the ground forces, and junior NCOs in particular suffered high casualties. The problem went away when the Johnson administration had the Army and Marines change their personnel policies to ensure that Blacks were not over-represented in the infantry. Catholics are another group that suffered a disproportionately, and there’s no doubt about this . One of the basic rites of induction into the armed forces, enlisted or officer, was having your religion stamped on your dog tags so you would get the appropriate ministration if you were wounded and the proper grave marker if you were killed. Protestants were the largest single religious group, but Protestant on the dog tags didn’t mean much unless a particular denomination was specified, Baptist, Methodist, Lutheran, and so on. But Catholic meant something; Catholics were a group with shared beliefs and values in a way that Protestants, with their myriad of denominations were not. By and large, the guys with Catholic on their tags who were killed in Vietnam grew up in Catholic families, went to Catholic schools, attended mass and the whole bit. They comprised about 22% of the male populace in the appropriate age groups and accounted for some 26% of the casualties. They included a lot of East Coast and Midwestern ethnics, young men from blue collar and middle class Italian, Czech, and Polish-American families among whom military service was a patriotic tradition. It turns out that Catholics may have suffered more than any other comparable group in the Vietnam War. Was the war in South Vietnam an internal rebellion? The anti-war movement pushed this view to support their contention that the US had no business intervening in South Vietnam’s internal affairs. It had an element of truth in that the vast majority of the Viet Cong rank and file during the early days of direct American involvement, 1960-64, were southerners. “Hawks,” those who backed American military support of the Diem government and, later, direct US military intervention, argued that while the ordinary Viet Cong were southerners, they got their arms, equipment, supplies, and—most important—their marching orders from the North. Anti-war proponents countered by arguing that while the Hanoi government was sympathetic to the Viet Cong and no doubt gave them a modest degree of aid and comfort, the VC were basically self-sustaining guerrillas who grew their own food, captured their weapons and ammunition from the ARVN, and so on. Actually, the Viet Cong (aka Peoples Liberation Armed Forces (PLAF)) had a good deal more autonomy than the Hawks argued. Yet in the final analysis they increasingly took orders from Hanoi as the war wore on. We now know that the PLAF received extensive logistical support from the North from 1962-63 on, and by mid-1964 were primarily armed with Chinese-manufactured, Soviet-designed weapons. By 1964, the PLAF were clearly on their way to becoming an arm of the NVA (aka Peoples Army of Vietnam (PAVN)), commanded from Hanoi. The first chapter in Stanley Karnow’s book, Vietnam: A History, published in 1984 and still probably the most widely-read general history of the war, is entitled “The War that Nobody Won.” (Karnow, a Boston Globe reporter, also served as the principal advisor for the PBS television series on the Vietnam War.) In fact, there were winners and losers. The Vietnamese communist party (formerly, the Indochinese Communist Party). The party’s leadership is not only overwhelmingly Vietnamese, but overwhelmingly North Vietnamese. The communists are undeniably in charge and in control of a unified, communist, Vietnam today. That was what they fought for, and that’s what they accomplished.. The leadership of the Peoples Republic of China, the Chinese Communist Party, is even more clearly in the winner’s circle. Their aid and assistance to their revolutionary Vietnamese colleagues played a major role in bringing down first the French, and then the United States and its Indochinese allies. It also played a huge role in securing the de-legitimization of Nationalist China, a major Chinese communist objective. Maybe most important– Vietnam was the pretext for the conversations that led to Nixon’s historic visit and the opening up of relations between China and the US. The Chinese communists have managed to retain their grip on political power while presiding over a truly remarkable economic transformation ever since. Indonesia nearly fell to a Communist coup in 1965, but the Army, acting with the support of Muslim groups and encouraged by the fact that we were standing fast in Vietnam, stopped the coup and wreaked bloody retaliation on the Communists. The US promptly moved in with a considerable amount of economic assistance, and Indonesia, blessed with huge oil reserves, swiftly worked its way up the ladder of economic development and into at least a semblance of democracy under the leadership of General Suharto. The Asian depression of the mid-1990s shocked the Indonesian economy particularly hard, Suharto’s overthrow produced a period of political chaos and sectarian violence that still hasn’t completely subsided, and horrible natural events like the tsunami, have taken a big toll on stability. One thing is certain, Indonesians have shown a remarkable resiliency through it all. It is the world’s largest Muslim country and in command of serious natural resources— it could still slide into the abyss, but the evidence supports at least cautious optimism. During our phase of the Vietnam War, and partly as a consequence of our spending in the area, the ASEAN nations began a period of remarkable economic development and prosperity. The South Korean story is similar, but more directly connected to our commitment to Vietnam. When the Koreans agreed to send large numbers of troops to South Vietnam, they did so with the stipulation that we had to meet their payroll and that the Korean troops would be paid exactly the same as our Gis. That represented untold riches to the Koreans, whose economy had been looted by Japan and then devastated by World War II and the Korean War. The bulk of the money paid to the Korean GIs went directly into the Korean economy. The economy took off, and by the 1980s Korea had made it into the ranks of industrialized nations. Democracy was a bit harder to come by but progress has been made over the years. Large numbers of US forces were based in Japan during the Vietnam War and generated a huge amount of cash inflow for the Japanese economy. The Yen was weak and the Dollar was strong. In addition large numbers of GIs took R&R (rest and relaxation) leaves in Japan, bringing lots of cash along with them. This was nothing new to the Japanese, just as Korea benefited enormously from infusions of US dollars during the Vietnam War, Japan had benefited similarly during the Korean War, with even more spectacular results. South Vietnam. Vietnam was unified under Communist rule by force, thousands who fought along side the US and French were sent to prison and re-education camps (or worse), strict economic and political centralization was enforced, and nearly a million refugees escaped by boat. Saigon was renamed Ho Chi Minh City. Ironically, the Southern communists did not fare well in the end– most of the top leadership positions in the new unified communist government went to Northerners, much to the chagrin of the NLF and Vietcong cadre who had fought so hard and given so much for independence. The newly unified Vietnam, however, had not seen the end of war. Even though both sides were communist, there had been skirmishing in Cambodia between PAVN and Khmer Rouge forces since 1973. Within the Communist world, Vietnam was principally backed by the Soviet Union, the Khmer Rouge was supported by China. The Third Indochina War escalated when Vietnam invaded Cambodia in 1978, and China countered by invading northern Vietnam in 1979. Among those who lost most were the non-Vietnamese peoples of French Indochina, starting with the Muong of North Vietnam who fought for the French. They suffered retribution from the Communists and then were put to work by them. We can add the tribes of northern Vietnam and Laos, notably the Nung, T’ai, Man and Hmong, who fought first for the French and then for us; It’s been reported that they were hunted down and destroyed, in the case of the Laotian Hmong, using some really nasty chemical/biological agents supplied by the Soviets, including so-called yellow rain. Read about General Vang Pao. Read Vang Pao – Obit. The fall of Saigon and Phnom Penh to communist forces in April 1975 hastened the decline of the coalition in Laos. Several months after these communist victories, the Pathet Lao entered Vientiane. On December 2, 1975, the king abdicated his throne and the communist Lao People’s Democratic Republic (LPDR) was established. The new communist government imposed centralized economic decision-making and broad security measures, including control of the media and the arrest and incarceration of many members of the previous government and military in “re-education camps.” These draconian policies and deteriorating economic conditions, along with government efforts to enforce political control, prompted an exodus of lowland Lao and ethnic Hmong from Laos. About 10% of the Lao population sought refugee status after 1975, many of whom resettled in third countries, including the United States. From 1975 to 1996, the U.S. resettled some 250,000 Lao refugees from Thailand, including 130,000 Hmong. The last major resettlement to the United States of about 15,000 Hmong from the Wat Tham Krabok camp was in 2004. Laos today is still one of the poorest and most remote countries on earth. Perhaps the biggest group of losers are the Vietnamese people. The North lost the better part of two generations of young men, killed in the French war or sent down the Ho Chi Minh Trail to fight, and mostly die, in the south. The South Vietnamese were devastated, their nation in shambles, and after communist victory they fled their country by the hundreds of thousands. The boat people left in several distinct waves. The first wave consisted mainly of those who could get their hands on a boat when Saigon fell. The second consisted of those who were devastated by communist economic “reforms” and who managed to survive communist reeducation camps. Chinese-Vietnamese were particularly hard hit: one estimate is that the majority of the 1.4 million Chinese-Vietnamese in the south left the country. As a rough estimate, about a million Vietnamese fled their country by boat and made it to safety. Estimates of those who were lost at sea and didn’t make it range from 40% to 70%. Then there are the Montagnards of South Vietnam. In their case, those who stayed behind are systematically being displaced by Vietnamese resettled into their tribal areas. The Portuguese Empire was a domino that did fall. Almost as soon as the North Vietnamese tanks rolled into Saigon, the Portuguese military, sick of fighting seemingly interminable wars against communist-backed guerrillas simply packed up and left for home. The resultant power vacuums in Mozambique, Angola, Guinea, and East Timor were immediately filled with warring factions backed, varyingly by the Soviet Union, Cuba, South Africa and, more discretely, by the United States. In the case of East Timor, an already bad situation was made worse when Indonesia invaded and annexed the territory. The ensuing guerrilla struggle was marked by years of brutality and was only recently sorted out. Finally, and most dramatically, we have the Cambodians, who were slaughtered by their Khmer Rouge rulers in the aftermath of victory in 1975. The massacre—between 2.6 and 3.3 million from a population of about 6.5 million—was so great as to justify the term genocide. We’ve already looked at some of the ways in which the Vietnam War affected the United States, and, at least in the strategic military sense, we surely lost the war. We lost 58,000 of our finest young men and spent countless millions of dollars along the way. In addition our international credibility and prestige took a serious hit, the people began the long slide toward losing almost total faith in our government, and we experienced deep emotional and political divisions that still remain. USSR: the question here is what role did Soviet support of North Vietnam play in the collapse of the Soviet Union? The answer at this point is that we simply don’t know. That support was considerable, and the Soviet’s didn’t have all that much surplus capacity to play with, but at this point we can’t say. The Philippines were heavily affected by the Vietnam War—we spent huge sums of money maintaining air and naval bases there—but the Philippines was the one ASEAN nation that didn’t fully share in the economic upsurge in the years after the war. The reasons have mostly to do with internal politics. The Philippines are ruled by some forty families of Spanish ancestry who would rather keep their country under control than introduce too much openness and free trade. For years Marcos saw to their demands. Since his ouster the Philippines have made slow progress toward functional democracy over the years but there is still far to go. The impact of the Vietnam War on Australia mirrors that of our country to a remarkable degree. Same political fissures, same open wounds. Taiwan, alias Nationalist China, was expelled from the ranks of recognized independent nations by Richard Nixon’s diplomacy and now lives under the threat of invasion by the People’s Republic of China. Taiwan has fully participated in the wave of prosperity that swept non-communist Asia from the 1970s and is now a functioning democracy, realities that surely make Taiwan more of a perceived threat to mainland China’s leaders. Last is the antiwar movement.. By 1973, with the signing of the Paris Peace accords, the antiwar activists had secured their biggest stated objective– the complete withdrawal of US military troops from Vietnam. But there was no celebration to go along with that bittersweet success. It was a pyrrhic victory at best. Vietnam had been a long and very unpleasant national experience and mostly folks just wanted to forget it.